Jan Berenstain dies. We attack her. Can we wait a few hours before attacking the dead? Photography © Random House Children’s Books. Just yesterday, Slate’s Hanna Rosin, my own beloved editor, wrote: “The world today brings news that Jan Berenstain, co-author with her husband Stan, of the 45 years and running Berenstain Bears series for children, has passed on to a better world. 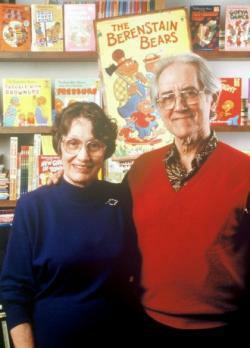 As any right thinking mother will agree, good riddance.” She was talking about the cartoon bears, of course, and not Jan Berenstain herself, the small 88-year-old, with her bangs and glasses, photographed holding her special pens and special pad, still creating, still drawing in her ninth decade. Hanna was presumably not saying “good riddance” as in, it is good that Jan Berenstain suffered a stroke and died in her hospital bed, and the clever analysis of the ubiquitous children’s series that follows this flashy statement is entirely fair and well-reasoned. And yet one wonders, whatever strong emotions one has about the cartoon bears in a children’s book, could that bold and harsh “good riddance,” have been resisted the day Jan Berenstain’s death was announced? Just as one tries not to wear fuchsia to a funeral, it seems that one might fruitfully reserve one’s more pointed critiques for another occasion. There is, however, an increasing fashion for these negative obituaries, this sharp summing up of dead people’s achievements in which they are found falling short, these personal attacks timed as the dead person’s possessions are still being retrieved in plastic bags by their relatives from the hospital. Rewinding a few months to Christopher Hitchens’ death, other contrarians felt stirrings of the same impulse. Somewhere Katha Pollitt woke up and had the feeling of delicious frisson: Here everyone is saying nice things about Christopher Hitchens, but she was courageous enough to say something nasty and critical and rigorous. To denounce “those passages of pointless linguistic pirouetting.”To tell the world the important fact that Christopher was not, in fact, a fun or charming drunk. I loved Hitchens, and so may be biased and especially ruffled by these pieces, but I still wonder if obituaries are the right venue to air your condescension toward someone’s work, to analyze the question of whether someone was in fact as fun and charming a drunk as they are rumored to be. I recognize that these and other writers are responding to the increasing pressure in the blogosphere to churn out something new, original, something with a little spark, a little surprise; I understand that the morning’s news is combed and gleaned for some little nugget to be original about, to show off and display the writer’s own special thoughts and ruminations, but would it be the worst thing in the world if death notices remained predictably respectful and straightforwardly journalistic and newsy? If the bloggers and ironists and professional contrarians were quiet for a few hours? I can’t help thinking that there is something monumental in a death, something worthy of a pause, a moment, a cessation of schadenfreude and gregarious noise. I can’t help thinking that we could, without too much inconvenience or suffering, wait a few days for the performance of our own cleverness.